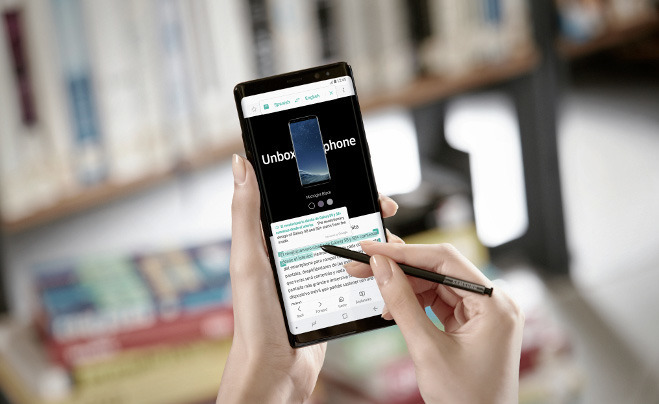 The Note 8 includes a 6.3-inch, 2,960-by-1,440 OLED "Infinity" display, 6 gigabytes of RAM, and in the U.S. an octa-core Qualcomm Snapdragon 835 processor. In other countries, the phone has a Samsung Exynos chip. The front includes an 8-megapixel f/1.7 camera, while the back sports two optically-stabilized 12-megapixel cameras —one a wide-angle f/1.7 module, the other a telephoto shooter with aperture topping out at f/2.4. Turning on "Live Focus" will selectively blur backgrounds, much like the Portrait mode on Apple's iPhone 7 Plus, while "Dual Capture" will stitch together images from both rear cameras while also saving them individually. Another Apple-like feature is "Live Messages," which will send messages written with the Note's S Pen as GIFs that animate the way they were drawn. Storage options include 64, 128, or 256 GB of flash storage, expandable via microSD. Among connection options are Bluetooth 5.0, USB-C, and a 3.5-millimeter headphone jack —nevertheless, Samsung is promising IP68 water and dust resistance. The device will ship with a version of Android 7.1.1, despite the recent announcement of Android Oreo. Preorders begin on Thursday, and through Sept. 24 will include either a Gear 360 camera or a 128-gigabyte memory card/fast wireless charging bundle for free. U.S. buyers will only get access to "Midnight Black" and "Orchid Gray" colors, but support for many different carriers, including AT&T, Verizon, T-Mobile, Sprint, U.S. Cellular, Xfinity Mobile, C Spire, Cricket Wireless, and Straight Talk. Outide the U.S., "Maple Gold" and "Deep Sea Blue" colors will be on sale. Still under wraps is the device's exact pricing, though it should be higher than the Galaxy S8 or S8+, the latter of which starts at $674.99. The Note 7 was a catastrophic failure for Samsung, costing the company over $5 billion as a result of two recalls connected with a series of battery fires. The company's reputation has rebounded somewhat thanks to the S8, but could still haunt the Note 8. The phone's release date may put it toe-to-toe with Apple's "iPhone 8", which is expected to feature an edge-to-edge, 5.8 OLED display and 3D facial recognition, the latter a new arrival in the smartphone market. Update: The Note 8 will cost $930 from T-Mobile, $950 from AT&T, or $960 from Verizon.